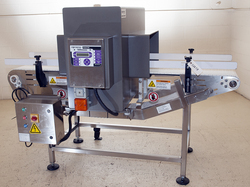 A Fortress Phantom belt transfer metal detector with a 10 5/8 inch high by 18 inch wide USABLE aperture opening (12 inch overall opening height before conveyor bed is considered), on a stainless steel through conveyor. Aluminum search head enclosure with interference-dampening flanges on each side of chute, complete with integral digital touchpad operator controls. The stainless steel belt conveyor is a 72.5 inch long by 15.75 inch wide interlocking plastic chain type belt, with 1/4 inch square openings, running in a right to left product flow direction from the operator control position. 32.5 inch working height on threaded rod adjustable foot pads. Complete / integrated with a belt-stop-alarm with beacon REJECT, and a variable frequency drive (VFD) variable-speed controller with gasketed stainless steel electrical / control box. 110 volt single phase (standard household current) electrical input. As of this writing this late model (was new 2011) food grade metal detection system, is in stock at Alard, in EXCELLENT operational, electrical, mechanical, and cosmetic condition, ready to go and available for immediate shipment. 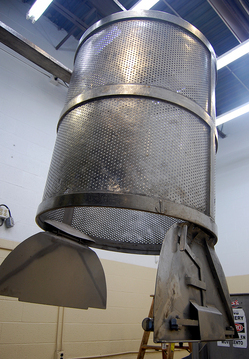 An all stainless steel industrial centrifugal dryer with a 30.5 inch diameter by 37 inch deep (14.7 cubic foot) perforated stainless steel spin drying basket with 1/8 inch perforations. Manufactuer rated for 300 lbs input capacity, and 3710 lbs per hour dried output on lettuce (actual results will vary with product characteristics). Manufacturer recommended as a leafy vegetable / pre-cut produce dryer for drying iceberg and romaine lettuce, spring mixes, spinach, cabbage, onions, carrots, broccoli, and other fresh-cut vegetables after washing. 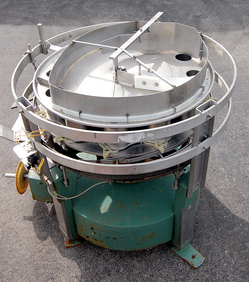 This food grade industrial vegetable spin dryer features a time-saving bottom-dump basket, which basket has "trap doors" which allow the product to be discharged from the bottom of the basket without tipping or tilting the basket to dump it; --there by decreasing cycle time and maximizing output. Powered top lid with anti-sling product guard that fits over the basket to prevent product from escaping. Hydraulic driven, with dynamic braking, complete with operator controls, with safety lid nterlock. Previously used plant hydraulic, so did / does not come with a hydraulic pump / reservoir, available separately (as your Alard Sales Representative to quote that option). As of this writing, this Heinzen spin dryer is in stock at Alard in good condition, available for timely shipment. 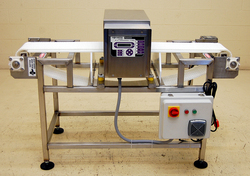 FOOD PROCESS METAL DETECTOR with NEW CONVEYOR, all stainess steel, 10 x 4 opening, with REJECT system. 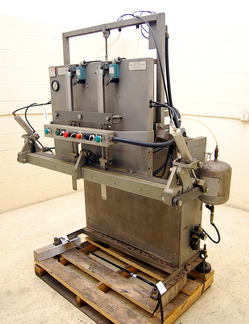 3 7/8 inch high x 10 1/8 inch wide usable aperture opening Fortress "Phantom" stainless steel search head with integral touchpad operator controls, mounted on a NEW stainless steel belt transfer through-conveyor. The conveyor has a new 60" long x 8" wide white plastic interlocking chain type belt, with 1/8 inch by 1/4 inch perforations, running over a new anti-static UHMW bed, running in a left to right product flow direction (from operator / control position). 33 inch working height on a tubular stainless steel conveyor frame, on threaded rod adjustable foot-pads. Complete with a belt-stop-alarm REJECT system, integrated with a new gasketed PVC electrical box with new variable speed control and new washdown SEW Eurodrive motor. 110 volt single phase electrical input. All food grade sanitary stainless steel construction, in a wash-down system configuration. 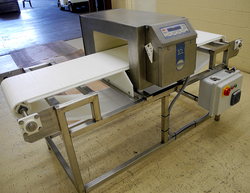 As of this writing, this refurbished food grade metal detector with new conveyor, is in stock at Alard in EXCELLENT operational, electrical, mechanical and cosmetic condition, available for immediate shipment. FRUIT AND VEGETABLE IMMERSION WASHER for floating products, all stainless steel construction. Consists of a 54 inches wide by 20 feet long by 32 inch deep tapered bottom washer tank, with a 48 inch wide by 14 foot long elevating discharge conveyor, with an underside cleaning brush. It features a side mounted recirculation tank with 18 inch wide by 40 inch long elevating solids removal conveyor. Water jets move product along toward the discharge conveyor, which has an over head rinsing spray bar. 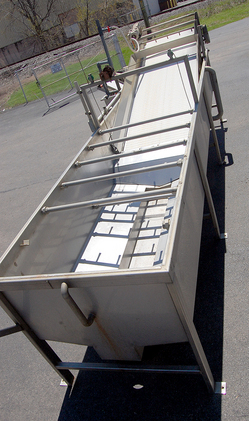 Includes a 48 inch wide by 11 foot long takeaway conveyor beyond the discharge. 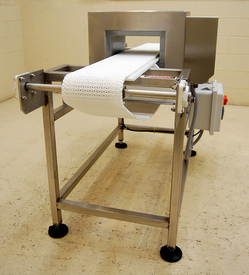 Conveyors all have perforated interlocking plastic chain type belts. All food grade stainless steel tank construction. Complete with 208 / 230 / 460 volt 3 phase drives. 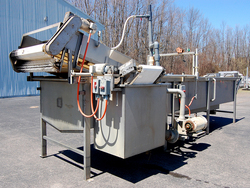 As of this writing, this vegetable washer / fruit washer in in stock at Alard, in good condition, available for timely shipment. 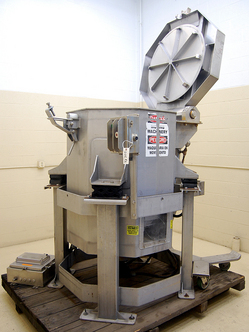 Manufacturer recommended for corase grinds, desinewing, and finish grinds, at up to 21,000 lbs per hour (depending on product characteristics, product temperature, and fineness of grind) on products such as beef, mutton, pork, poultry, seafood, veal and yeast. 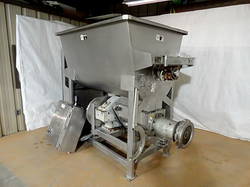 50 cubic foot hopper with self-feeding paddle system feeding a 9 inch diameter bottom feed screw to the grinder. 11 inch diameter grinder die plate. All food grade / USDA sanitary stainless steel. 5HP paddle agitator drive, 75 HP grinder drive, both 208/230/460 volt 3 phase. As of this writing, this Weiler meat grinder is in stock at an Alard affiliate, in good operable condition, available for timely shipment. 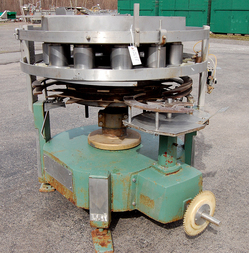 A continuous rotary filling machine for filling and / or portioning granular solid food products into 401 to 610 diameter cans, jars, or other rigid containers (with change parts to size) with a minimum of labor. Manufacturer recommended for whole or partial / portion control fills of chopped tomatoes, whole grain corn, sliced and diced vegetables (e.g. carrots, potatoes), cut asparagus, kraut, string beans, peas, beets, lima beans, greens, leafy begetables, fruits, berries, pickles, macaroni, coconut, meatballs, cubed meat, etc. Currently set with container handling parts for #10 cans (603 x 700), with 12 cups telescopically adjustable for pre-measuring fill volume, with wiper to automatically direct product into each cup. Complete with no-can-no-fill, indexing star infeed, and drive sprocket for seamer drive. Food grade sanitary stainless steel product contacts, on a painted steel base. As of this writing, this volumetric granular filler is in stock at Alard, in good condition, available for timely shipment. Snorkel style jaw type impulse bag sealer for modified atmosphere packaging, with a 54 inch wide sealing bar with dual snorkels, now set at a 34 inch working height (adjustable). Food grade / USDA sanitary stainless steel construction. Manufacturer recommended for poultry in 40-70 lb dry pack boxes; red meats bag-in-box; cheese bag-in-barrels, blocks, bulk; nuts bag-in-bins; bakery items; produce bags e.g. carrots, onions, spices; bulk fish packing; oxygen sensitive chemicals; metal parts; textile compression for package size reduction; moisture sensitive components and parts. Complete with operator controls for vacuum, gas-flush and dwell time, with two-handed activation switches, vane type motor-powered on-board vacuum pump with vacuum tank. 208/230/460 volt 3 phase electrical input. As of this writing, this bulk gas flushing bag sealer is in stock at Alard, in very good operational condition, available for timely shipment. A horizontal opening (the aperture opening is wider than it is high) food grade stainless steel digital metal detector. Exact USABLE aperture opening dimensions are 6 5/8 inches high by 17 5/8 inches wide. Intended for food product applications; food grade, wash down sealed, stainless steel search head enclosure with touch pad operator controls. For food process metal detection of ferrous, non ferrous, and stainless steel metal contamination in food processing, packaging, and production. As of this writing, we are in the process of fabricating a NEW STAINLESS STEEL THROUGH-CONVEYOR, with a 15.75 inch wide by 72 inch long solid plastic interlocking chain type belt over a UHMW plastic bed, on a tubular stainless steel frame. The conveyor will run in a left-to-right product flow (from the perspective ofthe operator control panel), at a 33" working height on height-adjustable foot pads. The conveyor will be complete with BELT-STOP-ALARM reject system with a new PVC control box, and new washdown fractional horsepower drive with a 110 volt single phase electrical input variable speed controller. All components gasketed / sealed in a food grade sanitary wash down configuration. 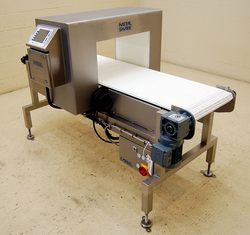 This refurbished metal detector is available on an all NEW conveyor, and is available for immediate shipment. Cassel Metalshark2 4-FREQUENCY washdown sealed T316 stainless steel conveyorized metal detector with 10 7/8 inch high (275mm) by 19 11/16 inch (500mm) wide USABLE aperture opening, mounted on a T316 stainless steel frame through-conveyor. The search head is complete with integral touchpad operator controls, with a 5.4 inch color screen, including RS-232 and RS-485 serial data acquisition ports, and ethernet data interface, in a T316 stainless steel enclosure. Optional data logging software is available for tracking and reporting for HACCP and other quality assurance and certification regimes. 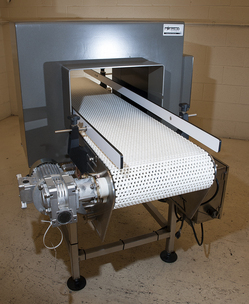 The T316 stainless steel frame washdown belt transfer conveyor has a 71.5 inch long (1800 millimetes) long by 17 9/16 inch (450mm) wide interlocking plastic chain type belt, running at a 30 inch (762mm) working height, with adjustable feet allowing +/-4 inch (100mm) height adjustment. The thru-conveyor is complete with a belt-stop alarm reject configuration, and a variable frequency speed control for the 110 volt single phase drive, adjustable from 16 to 75 feet per minute (approximately 5 to 23 meters per minute) belt speed. FOUR FREQUENCY LEVELS (35kHz, 75kHz, 150kHz, and 300kHz), allowing for optimal sensitivity across an exceptionally wide range of products / product types (wet, dry, salty, meat, fruits, vegetables, fresh, frozen, hot, cold, etc) allowing for maximum versatility with the widest range of products. The optimal frequency is automatically set by the system in "product learn"mode to maximize sensitivity / minimize false rejects with your specific product. Sensitivity varies depending on product run, and frequency setting (determinedby product characteristics), especially where wet, salty, or acidic products that are electrically conductive introduce "product effect" into the equation, however the manufacturer rates dry sensitivity for this head, with no product in the aperture, at a maximum sensitivity of 1.7mm ferrous, 2.3mm non ferrous, and 2.7mm stainless steel at 300 kHz. Quick teach feature learns new products in 4 to 7 passes. The contol unit allows for 120 product presets, where product presets save the frequency setting with the other tuning data. Single control board technology with all control electronics on one circuit board maximizes reliability, and minimizes maintenance expenses. As of this writing, this food process metal detection system is in stock at Alard, brand new, ready to go, and available for immediate shipment.